Cuban independent journalist Adolfo Fernández Saínz has enough of his own problems. Arrested during the "black spring" of 2003, he was sentenced to 15 years in prison, and is currently in the Canaleta prison in Ciego de Ávila. Like other prisoners, Domínguez has been subjected to various brutalities, and as a result, his health has suffered. In his most recent dispatch from the gulag, however, Fernández worries not about himself, but about another "black spring" political prisoner at Canaleta, Antonio Díaz Sánchez, who, for lack of better description, is being tortured to death because of his continued resistance and intransigence in the face of attempts by his captors to break his will, to break his spirit. Here is my translation of Fernández's report, entitled "Where is the line?" How many times will they punish Antonio Díaz Sánchez for not wearing a prison uniform? He is a political prisoner, a member of the Group of 75 sentenced to 20 years in the Canaleta provincial prison. In September 2008, he was taken to Havana for medical reasons. He was in the Carlos J. Finlay Military Hospital, in the penal ward. There, the State Security police offered that if he were to wear a prison uniform, they would let him complete his sentence in Havana. He refused. He said he was a political prisoner. They threatened to return him to Canaleta, but he continued to refuse so they returned him here. This was his first punishment. They took him to solitary confinement for the same reason. This was his second punishment. There, the conditions worsened. They do not let him go out in the sun, because he refuses to be handcuffed, given his status as a political prisoner. They do not let him see his wife in the solarium 12 meters away, which is the third punishment. They do not let him use a telephone, which is a fourth punishment. ... He has passed six letters for his wife to the guards, and she has not received any of them. This constitutes a grave violation of the right to correspondence. Smith, the chief of re-education, said he would not be able to receive religious assistance. That is another serious violation of his rights. Recently, my wife brought a carton of cigarettes and some crackers that his family sent him from Havana. They did not let him receive them. His wife brought him some newspapers on her last visit, but he was not allowed to receive them. That is a violation of his right to be informed, to read the press. 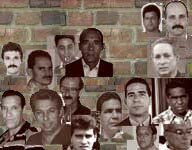 I wish for human rights organizations in Cuba and abroad to demand that if they are to keep him in a punishment cell, that they demand that they respect his rights as a prisoner. Write to the prison warden Lt. Col. Reinerio Díaz Betancourt and demand that he respect the rights of Antonio Díaz Sánchez. Fernández is right to implore the international community to stand up for Sánchez, who is being punished severely because of his character and commitment to his cause. And with this act of selflessness, Fernández shows why it is right for the world to also stand up for him. H/T to CAPPF/CDHD-2506 for the original Spanish-language version of this report.